Audiard’s latest feature is a muscular cinematic tour de force, which could, with time, rank itself near ‘Goodfellas’, ‘Heat’ and ‘City of God’ as undeniable and supremely entertaining and inspiring crime epic masterpieces. Audiard throws us into a French prison with his young hero, Malik, who’s in for 6 years for assaulting a cop. Since he’s turned 19 he’s been moved from juvie to the big boys. Of course, he’s shy and awkward, but not afraid to stand up and show his toughness to the fellow prisoners. Since he’s Muslim he’s put in B- Block with others of his faith. On the other side are the Corsicans, French of Italian descent, who through their organized connections on the outside are the kings of the joint. Malik becomes ingratiated with the local boss Cesar Luciani when he’s forced into doing a hit on a fellow inmate. Slowly we watch Malik play with the politics of the prison yard, playing both sides of the racial divide. When Malik is granted periodic day passes of leave, he elevates his influence outside the walls into his own empire of organized crime, eventually overtaking the once feared Luciani. 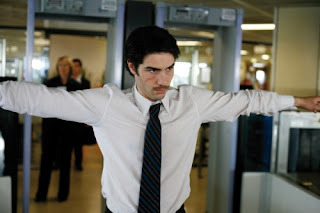 Tahar Rahim, as Malik, inhabits the skin of Malik. From the first scene, which brings him into the adult prison, we believe in Malik, and sympathize with him. There’s a distinct acknowledgement of Hollywood gangster history as Audiard chart’s Malik’s journey from young nave to sophisticated gangster. He’s part Michael Corleone, part Henry Hill, and through every step of the way Audiard is in Malik’s eyes and ears. Every moment of pause and reflection is dramatized with precision. Malik’s first hit on a fellow Muslim, who genuinely cares for Malik’s well being, is an intense and suspense sequence. We watch as Malik practices placing a razor blade in his mouth, and then removing it quickly to strike at his opponent - a scene, which, throughout the film, lingers in Malik’s memory often haunting him in moments of doubt. The plotting of the gangster politics is complex, and it takes a careful ear to catch everyone’s movements and motivations, but since Audiard never leaves Malik he’s a rock solid emotional base to which he always returns. It’s prison life here and so it’s the world of men only. Audiard thankfully doesn’t even attempt to engineer a love story or any other attempts at redemption or escape from his life. For Audiard, Malik and thus, us, the audience it’s a struggle survival at every turn. Thankfully we’re also saved from another social realism treatment of the subject. Unlike the over praised ‘Gomorrah’ (nope, I'm not a fan) Audiard mixes his prison grittiness with an assured cinematic flare. Freeze frame intertitles which tell us who the characters are, and introduce specific chapters of the story, serve no other purpose than for style; Audiard shows us a number of arty subjective dream sequences revealing Malik’s self-doubt; and a number of carefully placed but not overused songs add the right amount of pop culture anchoring as well. Unfortunately an opportunity to send the film into the stratosphere is missed with an ill-chosen ironic Mac the Knife cover by Jimmie Dale Gilmour, which takes the film into the credits. I couldn’t help but think of the effectiveness of Sid Vicious’ ‘My Way’ or Moby’s grandiloquent piano outro from ‘Heat’ or ELO’s ‘Living Thing’ from ‘Boogie Nights’, which ended those films with authority. ‘A Prophet’ unfortunately goes out with a wink instead of a bang. Oh well, its not enough to reduce the power of Audiard’s crime masterpiece.